← Regiments of Renown- photo dump! 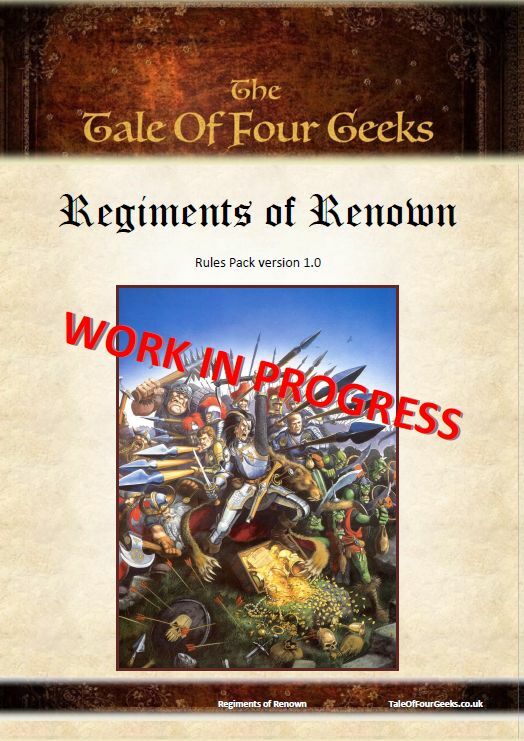 Due to the overwhelming response on Twitter that players would be interested in trying out my scenarios for RoR I decided to put together a quick rules pack with the T4G version of the Regiments of Renown Rules. Since it is unlikely the Events Team will update their pack until the next event is announced (probably 6 months) we have taken their fantastic rules set and provided our own additions and alterations in an attempt to make the system slightly more balanced and fun based on our experiences at the first RoR event at Warhammer World. All credit must go to the GW Events Team for the basis of the rules which make up the large majority of this pack. The rules have been copied, reworded and alerted in a few places, but ultimately we decided it was easier to copy all the rules across to a new Rules Pack (ready for distribution at future T4G RoR events) rather than making a small errata to the existing pack. Epic Flail removed, and replaced with a frenzy ability. (It’s filth, and was in 90% of lists). Victory Points altered. Separate set of standard Victory Conditions for all scenarios, in addition to Scenario VPs. Please playtest the above rules and let us know what you think! If you feel the changes to the original system help, or hinder the system please let us know either way. If you could also try the Scenarios and share your thoughts that would be excellent. This entry was posted in Regiments of Renown, Tournaments, Warhammer Fantasy and tagged podcast tournament, regiments of renown, T4g, tale of four gamers, tale of four geeks, Tournament, warhammer, warhammer fantasy, warhammer regiments of renown, Warhammer Tournament, whfb. Bookmark the permalink. One Response to T4G Regiments of Renown Rules Pack! I am not sure where youu are getting your info, but good topic. I needs to spend some time learning mor or understanding more.